We arrived not knowing what to expect. We were told that you can't actually hike into the volcanic crater as excessive foot traffic would damage it, which makes sense. But there are also a few other trails through the lava fields that are very interesting. And if you like playing "The Floor Is Lava", well, this place will be challenging since lava is literally everywhere and you're not allowed to climb up on anything. The color contrast here is pretty cool. The lizards have a camouflage that matches the sage green lichen on black lava. The lizard is in the foreground, on the rock. 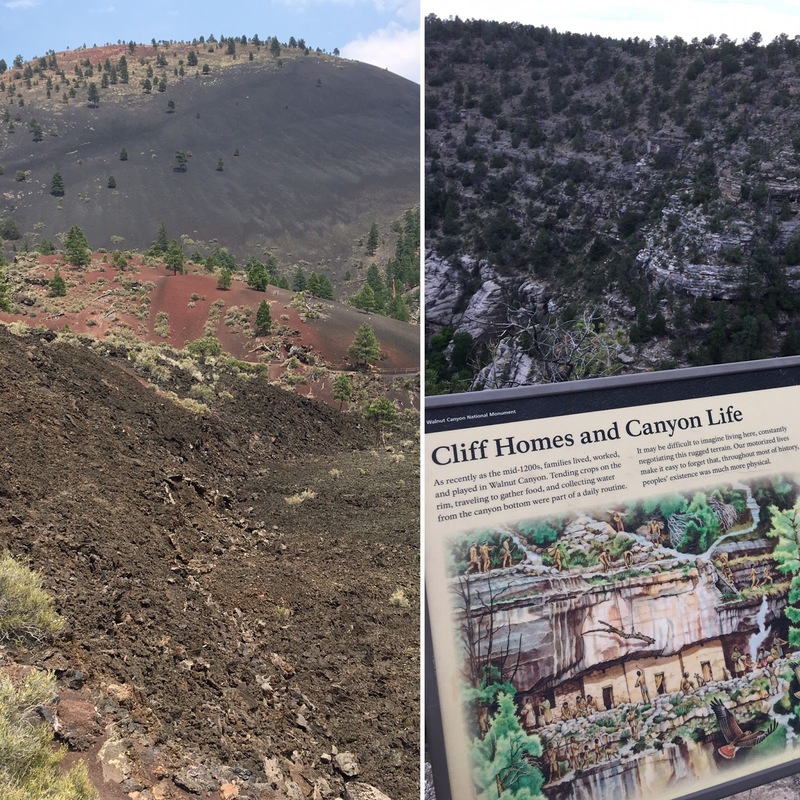 The second hike we took followed a concrete path to a point where the trail became volcanic cinder. This is why you don't climb on the volcanic cones. Brown, Red, and Black Rock. It was strange to see the ground shift from red to black and back again. There is also a bridge that spans over a fissure. We forgot to do the Junior Ranger badge here, as we wanted to get to Walnut Canyon before it closed. We arrived at Walnut Canyon about 10 minutes before the trail closed (4pm) so we had about an hour to learn about the Hopi cave-dwellers who used to live here before the park closed at 5pm. The dwellings are build under an overhang of the cliff, so that only the side and front walls needed to be built. I don't know why, but I really liked that they also had a small hole over the door to let smoke escape from the interior fireplace. Our girls got their second Junior Ranger badges, but rather than plastic, the ones here are laser etched wood. Maybe not walnut, but still cool. We left Walnut Canyon and drove back to Flagstaff on Route 66 for a quick bite at the mall before heading to our hotel in Holbrook (not a lot of food options out here). We also made a stop in Winslow, Arizona, where they have a little display at west second st and north Kinsley ave. maybe you've heard it mentioned in a song at some point? We had another dose of Americana at the Sipp Shoppe, drinking a mint chip milkshake while watching the cars go by. The place is decked out in vintage Coca-Cola signs, and black & white photos of the town back in the day. We reached Holbrook at 8:15 pm and pulled into our hotel, the Route 66 themed Globetrotter Lodge. 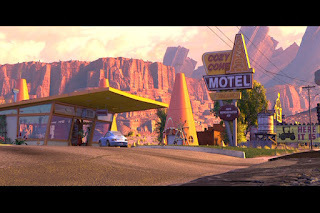 Our hotel is right across the street from the Wigwam hotel, which might remind you of the Cozy Cone Motel? from Pixar's Cars movie. We set our alarms to be ready to roll at 7:30 am tomorrow, so that we would have enough time to explore the Petrified Forest and Painted Desert before driving back to Albuquerque.